On September 30th, Lara and I, her Dad and her Grandparents made our way by hired Limo to the hotel - well, its not often that you get treated to such a glamourous night out!! We felt very special walking in on the red carpet and enjoyed a glass (or two) of champagne before dinner. Lara was thrilled to receive a number of comments on how gorgeous she looked!! After dinner the awards ceremony began and as soon as they began mentioning the Child in the Community award it became apparent that Lara had won. Following my voice recording and her photo montage Lara’s name was announced by the compare of the evening and Lara was on the stage in a shot!! Her face was an absolute picture as she received her engraved glass trophy and she answered all of the questions that she was asked in a clear and confident voice! I cannot tell you exactly what it was that she said as by this time I was blubbing like a baby!!! Lara won the award for her fund raising efforts for our local and for Great Ormond Street Hospital in London. In her short life she has to date endured approximately 40 hospital admissions, some of them very lengthy - and whenever she gets the opportunity she gets fund raising for these hospitals to try to pay them back for the wonderful treatment that she has received and also to help other unfortunate children that find themselves admitted too!! Funds have been raised via family and friends, school and her Brownie Guide pack and to date she has provided all of the cubicles on her local kids ward with a new colour TV, DVDs and last Christmas time a present from Santa for everyone!! 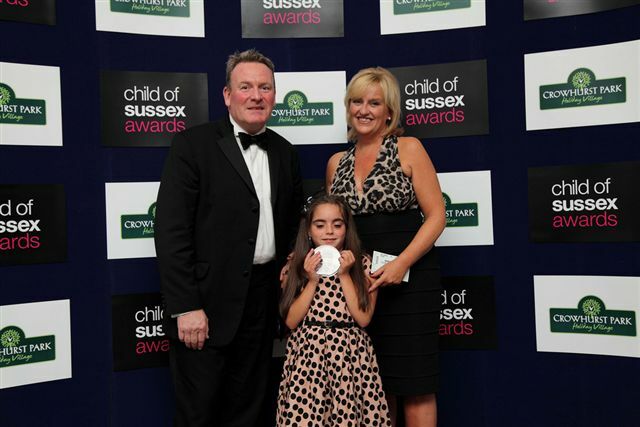 Great Ormond Street have benefitted from portable DVD Players and Lara continues to help by being the face of West Sussex on the Great Ormond Street Charity website!! I always admire Lara for her strength of character during the tough times and for being the beautiful little girl that she is - but on this night I was the proudest Mummy on the planet! !